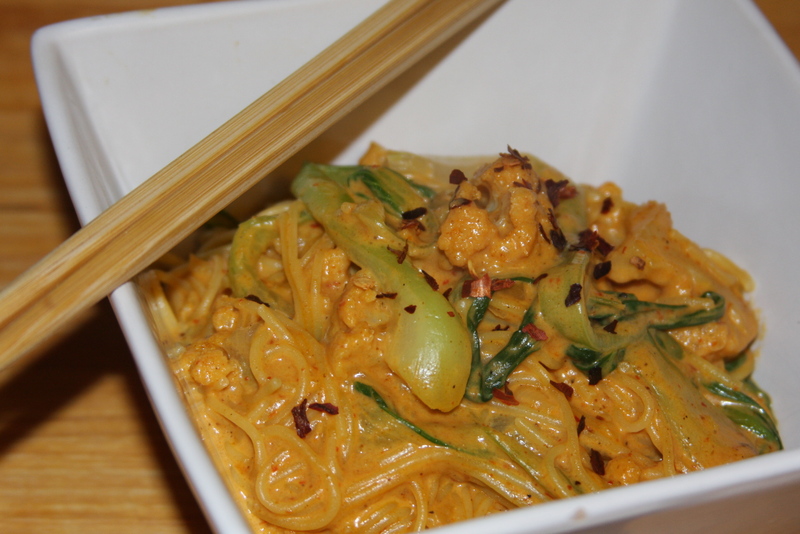 Coconut curry noodle bowl, with baby bok choy and cauliflower | eating with S.O.L.E. In a medium pot sauté 1/2 yellow onion in about 1/4 cup of organic canola oil, once the onion is translucent, add 1 minced garlic clove along with a thumb sized minced piece of ginger. Cook over medium heat for about 1 minute adding spice slowly : and don’t stress if you don’t have any of the following spices, just use what you can ( I have a huge spice pantry but I make curry different every time, just have fun and spice it up) aprox: 1 tbsp yellow curry, 1 tsp chili, 1 tsp coriander, 1 tbsp gara masala, 4 lime leaves dried, 6 large basil leaves whole and fresh (remove all leaves these before adding noodles) 1 tsp Aleppo Chilies, and S+P, “toast” spices in oil. Now add 1/2 small can of tomato paste bring together and add 3/4 of a large can of coconut milk and reduce heat. Chop 1/4 head of cauliflower into small florets, and add these to the sauce and cook down for about 15-20 minutes. 2 baby bok choy’s separate and slice each stem length wise into 1/2 cm strips. Bring a large pot of salted water to boil and add the noodles and the bok choy strips at the same time. Boil according to pasta directions the Soba King Corn / rice noodles I cooked for about 7 minutes, strain then add to curry sauce and cauliflower. Mix together, and garnish with fresh cilantro and or chili flakes. I served this with home made gluten free veggie pakora’s with spicy ketchup.. but I will post that recipe later!